School starts again today after our week’s holiday, which means I’ll be back in the classroom surrounded by grabby hands and sticky fingers. As if that wasn’t an exciting enough way to spend a Monday, the UK has been experiencing what’s supposedly the worst storm in decades. Luckily it hasn’t really reached us up here in the north of the country, and our outside wheelie bin remains upright after having experienced no more than a bit of wind and some heavy rain (i.e. normal October weather). A Monday like this definitely calls for pastry, in the form of a spinach and ricotta strudel with chickpeas. However, despite my end-of-holiday weariness, at least I went for the ‘healthiest’ form of pastry – filo, which is much lower in fat and calories than other types. It does the job perfectly – it makes a satisfying pie (or strudel in this case), and holds the filling securely together, without any reason to feel guilty. Spinach and ricotta is definitely one of my favourite flavour combinations – I love the milky flavour of the ricotta, and the spinach adds nutrients and texture without overwhelming the mild cheese. I also added some chickpeas for a bit of added protein, which also served to bulk up the strudel and make it feel more appropriate for the main meal of the day. By the way, I know a normal strudel is made in a long rectangular shape, but since the sheets of filo I used were slightly more square, I decided to go for a big, wide rectangle shape instead, which I cut into wedges. It worked just as well, so just make whatever shape works best with your filo sheets. 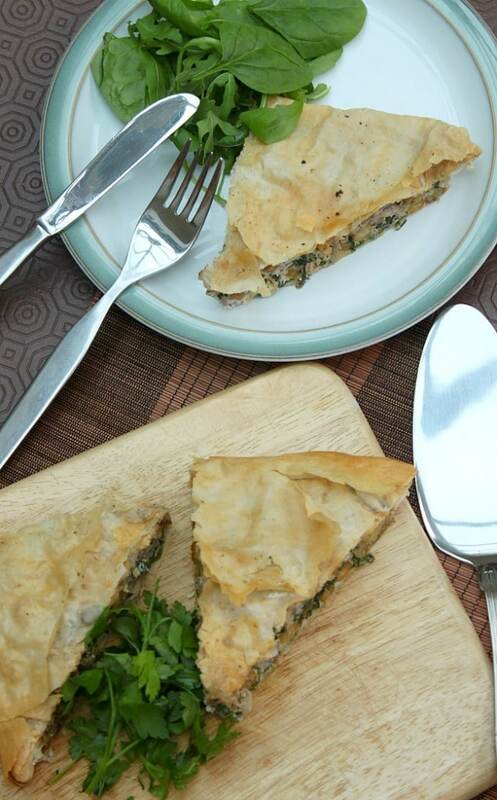 If you have some filo left over, why not try making yourself some white chocolate and pistachio baklava, leek, mushroom and goat’s cheese parcels, or margherita pizza cups? Heat the oil in a pan, and cook the red onion and garlic over a medium heat for a few minutes until transparent. Add the spinach, and cook for a further 1-2 minutes until wilted. Remove from the heat and leave to cool for a couple of minutes. Add the drained chickpeas, walnuts, ricotta cheese and the egg, and mix well. Season with a pinch of nutmeg and a generous amount of salt and pepper. Lay one sheet of filo on a lightly greased baking sheet, and give it a couple of sprays of oil. Add another sheet, spray again, and add a third sheet (you could use more than 3 if you like, but I think 3 works pretty well). Spoon your filling onto the pastry – since I made a large rectangular pie, I covered the whole sheet, just leaving an inch or so around each side. Spread the filling out into an even layer. Top with three more sheets of pastry, again spraying lightly with oil between each layer. Scrunch the excess pastry around each edge to seal the pie – I just loosely tucked it underneath. 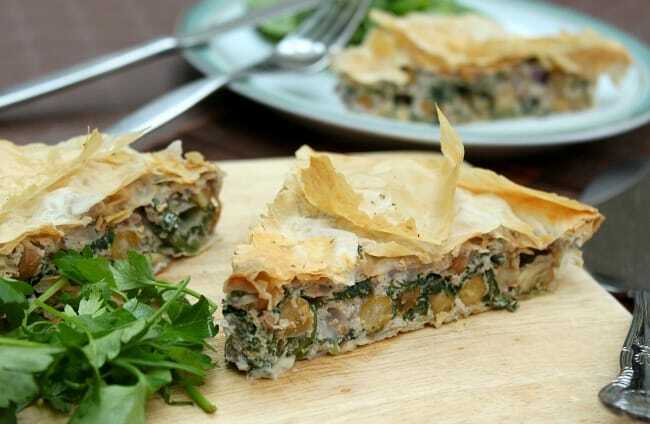 Make a couple of small slits in the top, and bake for around 40 minutes, until the pastry is golden brown. Lovely strudel, it has everything I enjoy. Beautiful pictures. 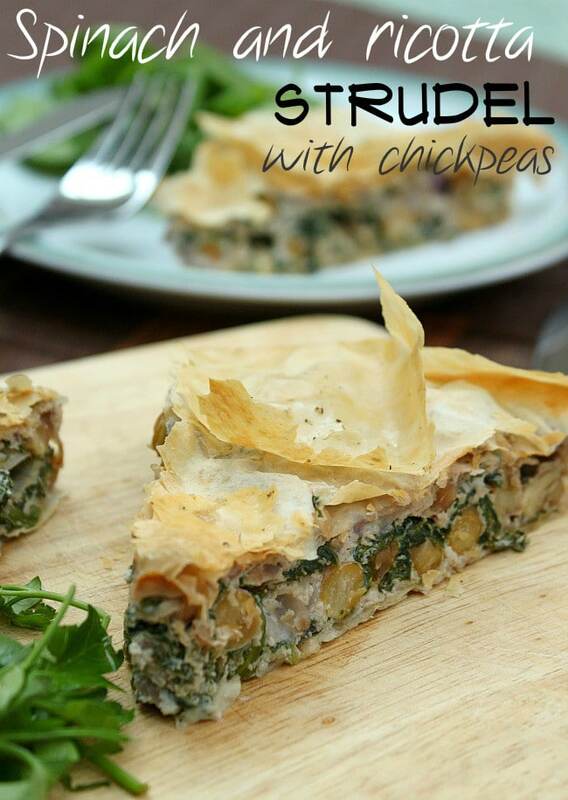 I love that you used filo pastry for this- all those flaky layers are what always get to me! stay dry with that crazy weather! Never tried chickpeas in one before, interesting twist. Lovely! Will try straight away! Stunning photos! Looks like a delicious dish – love the addition of walnuts. wow this looks amazing!! you did it again!